Carrón, the head of the Fraternity of Communion and Liberation, gave this message for Christmas. He writes from Milan, Italy. gives joy and breadth is also a thread that runs through my whole life. says that it would be unendurable. At 7:30 this morning in Rome, Pope Benedict XVI offered the Sacrifice of the Mass in the Paoline Chapel of the Vatican Apostolic Palace, for peaceful repose of the soul of Manuela Camagni, the Memor Domini who was a part of the Papal Family who died November 24 as a consequence of being hit by a car. In the last days of her life, our dear Manuela used to talk about the fact that on November 29 she would have belonged to the community of Memores Domini for thirty years. And she said that with a great joy, getting ready – such was the impression – for an interior feast celebrating her path of thirty years towards the Lord, in communion with the Lord’s friends. But the feast was different from what was expected: precisely on November 29 we took her to the cemetery, we sang asking for the Angels to accompany her to Heaven, we guided her to the ultimate feast, to God’s great feast, to the Lamb’s Wedding. Thirty years walking towards the Lord, entering the Lord’s feast. Manuela was a “wise, prudent virgin,” she had oil in her lamp, the oil of faith, a lived faith, a faith nourished by prayer, by a dialogue with the Lord, by her meditation on the Word of God, by communion in her friendship with Christ. And this faith was hope, wisdom, it was certainty that faith opens up to the real future. And faith was charity, it was giving herself for the others, it was living in the service of the Lord for the others. I, personally, must thank for her availability to put her energies at work in my house, with this spirit of charity and of hope that comes from faith. She entered the Lord’s feast as a prudent and wise virgin because she lived not in the superficiality of those who forget the greatness of our vocation, but in the great expectation of the eternal life; so she was ready when the Lord came. Saint Bonaventure says that the memory of the Creator is inscribed in the depths of our being. And precisely because this memory is inscribed in our being, we can recognize the Creator in His creation, we can remember, see His traces in this cosmos created by Him. Saint Bonaventure also says that this memory of the Creator is not merely a memory of the past, because the source is present, it is a memory of the presence of the Lord; it is also a memory of the future, because it is certain that we come from the goodness of God and that we are called to strive for the goodness of God. Therefore in this memory there is the element of joy, our origin in the joy that is God, and our call to reach the great joy. And we know that Manuela was a person interiorly penetrated by joy, precisely that joy that derives from the memory of God. But Saint Bonaventure also says that our memory, as well as all of our existence, is wounded by sin: therefore memory is obscured, is covered by other superficial memories, and we aren’t able any more to overcome these other superficial memories, to go deeper, all the way to the true memory that sustains our being. Therefore, because of this oblivion of God, because of this forgetfulness of the fundamental memory, also joy is covered, obscured. Yes, we know that we were created for the joy, but we don’t know any more where we can find this joy, and we look for it in various places. Today we see this desperate search for joy that increasingly moves away from its true source, the true joy. Oblivion of God, oblivion of our true memory. Manuela was not one of those who had forgotten memory: she lived precisely in the living memory of the Creator, in the joy of His creation, seeing God in all creation, even in the daily events of our lives, and she knew that joy comes from this memory – present and future. 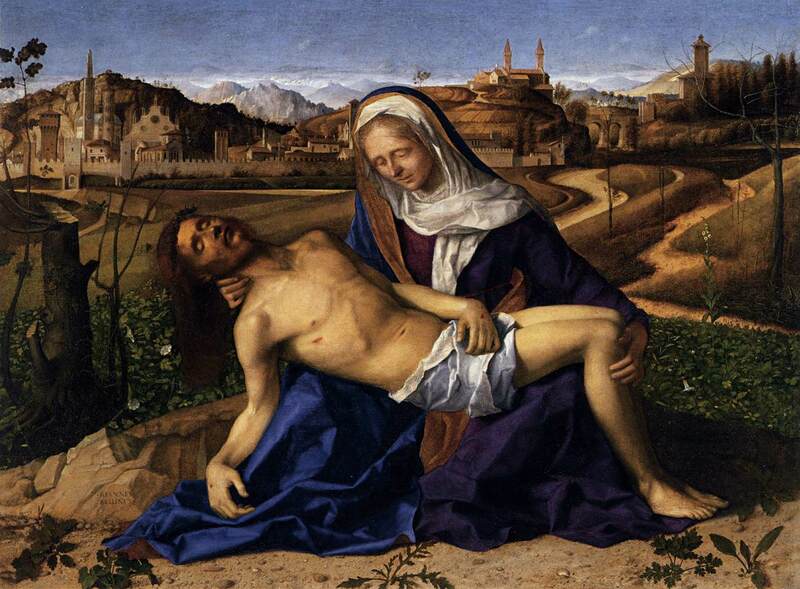 The Memores Domini know that Christ, on the eve of His passion, renewed, or better, elevated our memory. “Do this in memory of me,” He said, and in this way He gave us the memory of His presence, the memory of the gift of Himself, of the gift of His Body and of His Blood, and in this gift of His Body and Blood, in this gift of His infinite love, we touch again with our memory a stronger presence of God, of His gift of Himself. As Memor Domini, Manuela lived exactly this living memory, that the Lord gives Himself with His Body and renews our knowledge of God. In His dispute with the Sadducees about resurrection, the Lord tells them, who don’t believe in it: “God of Abraham, of Isaac, of Jacob”. Those three men are part of God’s name, are inscribed in God’s name, are in God’s name, in God’s memory, and therefore the Lord says: God is not for the dead, He is a God for the living people, and those who are part of God’s name, those who are in God’s memory are alive. Unfortunately, we human beings with our memory can remember only a shadow of the people we have loved. But God’s memory doesn’t keep only shadows, it originates life: the dead live here, with His life and in His life they have entered God’s memory, which is life. This is what the Lord tells us today: you are inscribed in God’s name, you live in God with a true life, you live from the true source of life. So, in this moment of sadness, we get comforted. And the new liturgy after the Council dares to teach us to sing “Halleluiah” even during the Mass for the dead. This is bold! We feel most of all the pain for the loss, we feel most of all the absence, the past, but the liturgy knows that we are in the Body of Christ and that we live starting from the memory of God, which is our memory. In this interlacement of His memory with ours we are together, we are living. Let’s pray the Lord that we may feel this communion of memory more and more, that our memory of God in Christ becomes more alive, so that we can feel that our true life is in Him and in Him we stay united. In this sense, we sing “Halleluiah”, certain that the Lord is life and that His love never ends. Amen. 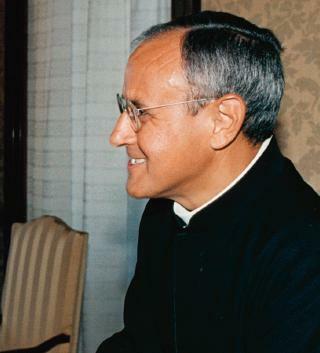 Father Julián Carrón’s message on the occasion of Manuela Camgni’s death can be read here. in Bagno di Romagna, Emilia-Romagna (northern Italian city). The Mass of Christian Burial was celebrated at La Chiesa di San Piero in Bagno di Romagna. various and significant happenings of the house. everything, from small actions to great choices, of work, study and fraternity. [Jesus sweet memory, that gives true joy to the heart]. where no one can accompany us, God awaits us: He is our Life. Jesus, I celebrated the Mass for Manuela’s soul the very morning of her death. with affection to her family, her fellow sisters and all of you my blessing. Manuela Camagni, 56, a member of the Memores Domini (the lay consecrated group of Communion and Liberation), died earlier today as a result of injuries sustained in a car accident Tuesday evening in Rome. She was taken to Rome’s Umberto I Polyclinic for treatment and latter died. 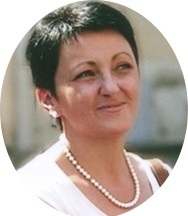 Manuela served in the Apostolic Household helping to care for the temporal needs of Pope Benedict XVI. She worked closely with Monsignors Georg Gaenswain and Alfred Xuereb, the two personal secretaries of the Pope. 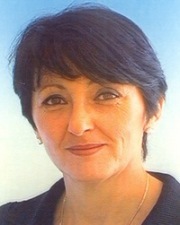 Manuela, with the three other Memores Domini, are among the closest collaborators, “the family” of His Holiness. 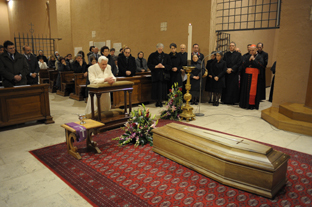 The Holy Father is very personally moved by the death of Manuela and offer Mass for her soul this morning. 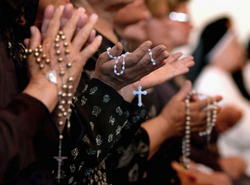 I bid you to pray for Manuela Camagni, her family and the Memores Domini. 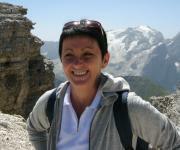 Rome Reports has a news item on death of Manuela Camagni. May the Lord grant mercy, peace, light and rest to Manuela. May her memory be eternal. 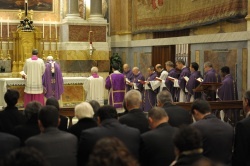 communiqué of the Assembly of the Italian Episcopal Conference, November 11, 2010). the Angelus, November 1, 2010).